Zoom Image For comparison: View into the empty plasma vessel, recorded by a black-white-camera installed inside the plasma vessel ... For comparison: View into the empty plasma vessel, recorded by a black-white-camera installed inside the plasma vessel. These pictures offer higher resolution and the camera is more light-sensitive than a colour camera. For comparison: View into the empty plasma vessel, recorded by a black-white-camera installed inside the plasma vessel. These pictures offer higher resolution and the camera is more light-sensitive than a colour camera. 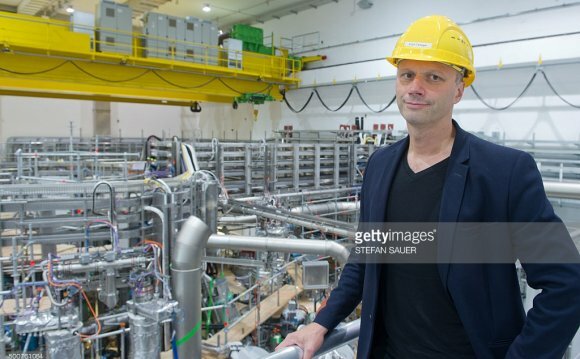 At present, only a tokamak is thought to be capable of producing an energy-supplying plasma and this is the international test reactor ITER, which is currently being constructed in Cadarache in the frame of a worldwide collaboration. Wendelstein 7-X, the world's largest stellarator-type fusion device, will not produce energy. Nevertheless, it should demonstrate that stellarators are also suitable as a power plant. Wendelstein 7-X is to put the quality of the plasma equilibrium and confinement on a par with that of a tokamak for the very first time. And with discharges lasting 30 minutes, the stellarator should demonstrate its fundamental advantage – the ability to operate continuously. In contrast, tokamaks can only operate in pulses without auxiliary equipment.